I'd prefer to not have the added complexity of a water cooled system, so I'm considering picking up this combo set on Ebay. Has anyone tried this one yet? 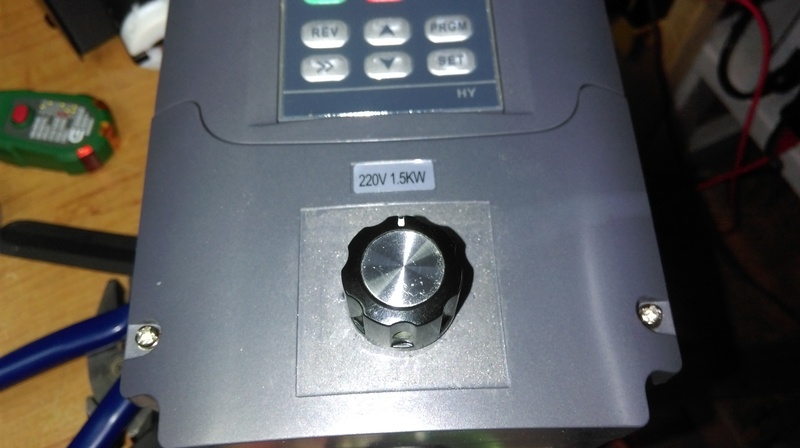 I'm in the USA, so I'll need a step up converter to 220V. Can anyone recommend one? I have been using one for about a year cutting g10. 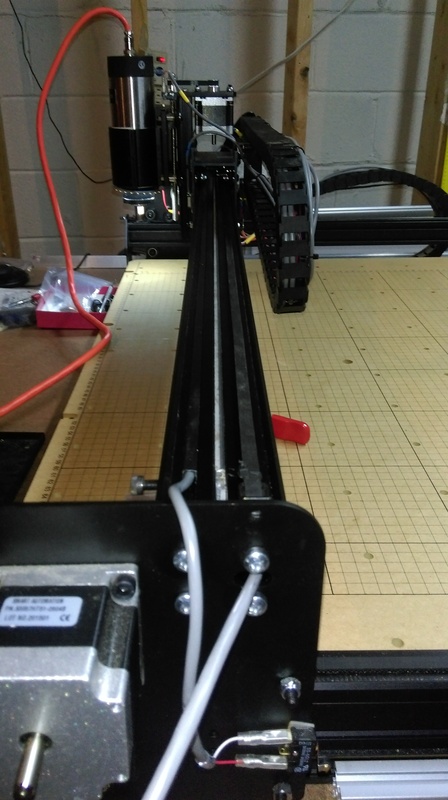 I just got my x-carve so I haven't attached it yet, but it worked great on my other cnc. I picked up a 110 volt VFD and it works fine. I have a water cooled spindle though. I got my 2nd spindle from that seller. At the time it said shipped from China but actually drop shipped from CA, I see they updated the shipping location. 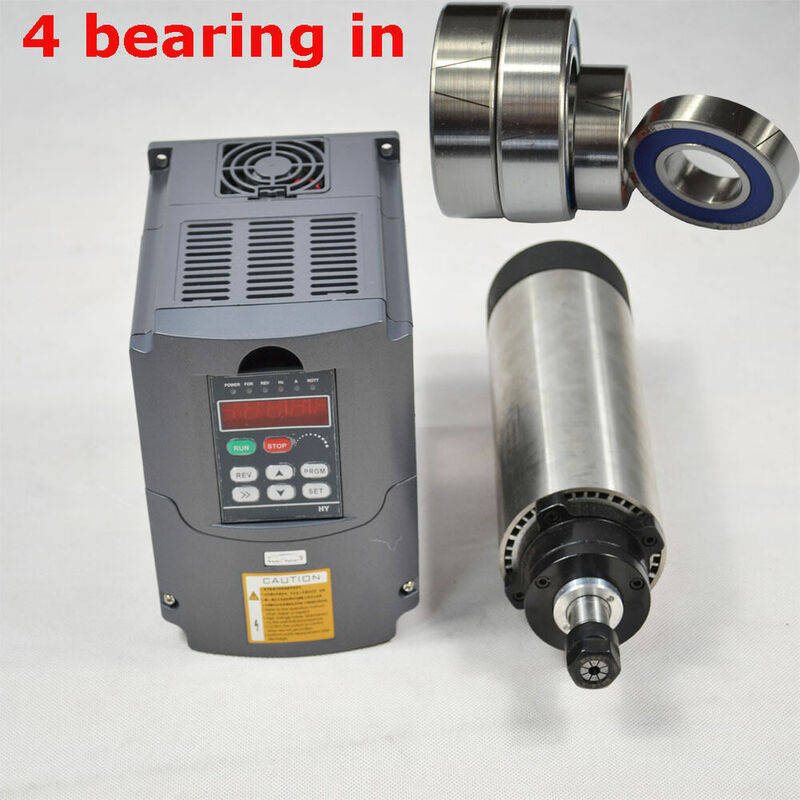 I got the 4 bearing but water cooled and the bearings from Germany. I just got a sub panel installed in the garage so I have 220V available. Seller provided all the settings I needed to change on the VFD and in what order. May I ask where you got a 110 vfd spindls? I pulled the trigger on the Aircooled and the 220v step up converter that @Travelphotog recommended. Thanks for the feedback guys. @ScottKelley Thanks for the help doing the X-Rails reinforcement mod yesterday!! They have local stock and the shipping was very fast. Bought my 220 there also. The guy who runs it is very good and he ships really fast in the USA. I received my VFD and Spindle yesterday and after reading through the VFD manual, I have a couple of questions. Which 220v Plugs works on the ELC T-5000? Also in the manual it is recommending that I wire the main circuit with No Fuse Breaker, Electromagnetic Contactor, and AC Reactor. Did you do this, or is just the T-5000 sufficient? I use this plug http://www.amazon.com/gp/product/B000FPDKTS?psc=1&redirect=true&ref_=oh_aui_detailpage_o06_s00 with 12 AWG 600V 3 conductor wire. I used a shielded 14 AWG 4 conductor VFD to spindle wire. 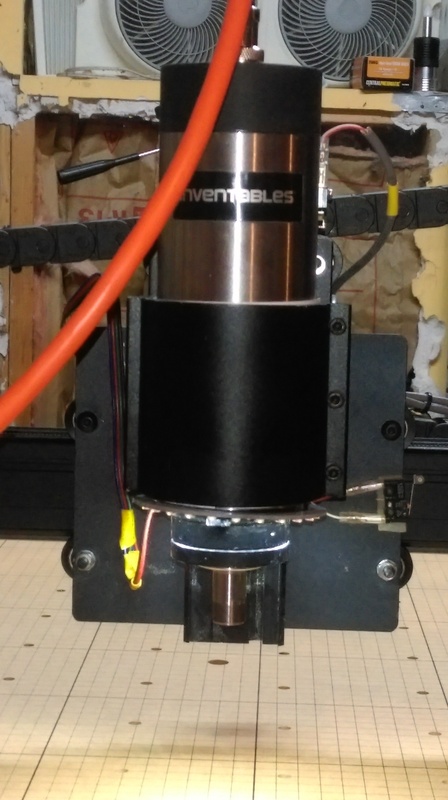 I have the T-5000 plugged into a normal outlet in my mill room and have had no issues at all so far in over 100 hrs or so of milling total to date. So, I have my VFD and spindle all wired up. This thing is sweet and quiet too. 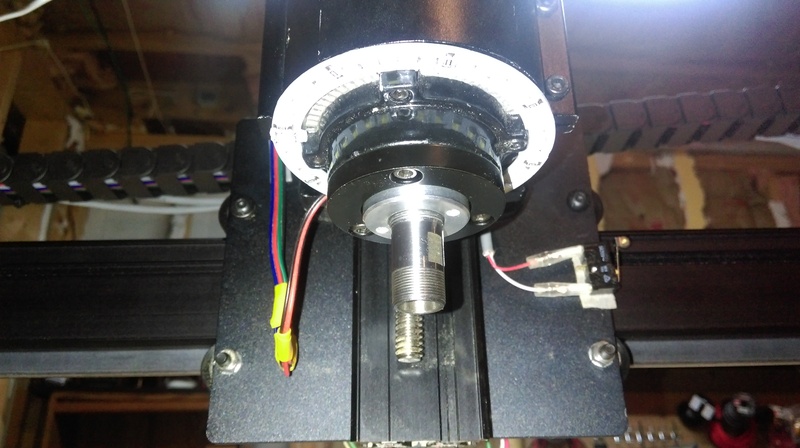 Only problem I had was I had misconfigured my settings somehow, and for some reason, my motor was getting really hot and it was blowing my circuit breaker. Fixed the wrong setting and it is working as it should now. Thanks for all the help and advise! Now to get it on my Xcarve and see what it can do. Anytime! Be mindful of DOC and feed rates in aluminum. The VFD will melt the chips onto the end mill if you do not watch out. I have been using this one and so far it seems to be working great. @Travelphotog I was thinking about purchasing GWizard for the feeds/speeds calculator to help me with that. Any thoughts? Is it worth the $79 per year? I tried it out last night and today.... I almost shot the mill with the 12GA.. But it is simply due to needing either coolant or at the VERY least a great vacuum system to remove the chips. The cutting was amazing, right up until it broke or clogged up the end mills. I have the 30 day trial and I honestly must say I was surprised the cuts the VFD and X Carver were making.. In the order of .5mmDOC and 1900+ MM/M cuts that were great, as long as you flushed the chips none stop. So the answer is yes, once you have something like a great vacuum shoe, a nonstop air stream to blow away chips or something along the lines of a Fog Buster (my first choice but for the cost). So in the next 29days of my trail I am going to try first a vacuum system and or a none stop stream of air to blow away the chips. Failing that I might pull the trigger on a fog buster. The massive increase in speed over cutting dry was amazing. Cut that i do now in 2-3 minutes were cut late last night in 20 seconds with info to Gwizard. I hope I can solve my chip clearing issue before my trail runs out. If I do, I will not be able to hit the BUY button fast enough. Not only do you need to clear the chips but WD40 is your friend. Alu and end mills don't like running without a little lube to keep the chips from welding to the cutter. Fog buster with coolmist 77 or 78 coolant mixed at the right ratio and with the buster set so it just puts the minimal amount of coolant on the job but does not make every thing wet will also keep the chips from welding to the tool. Gwizard is a great tool for the CNC machine owner. If you watch Bobs website and get his news letters he has sales from time to time where you can get a great deal on a life time membership. Wow, 20 seconds for a cut that took 2 or 3 minutes. Impressive. What machine settings did you use with Gwizard? 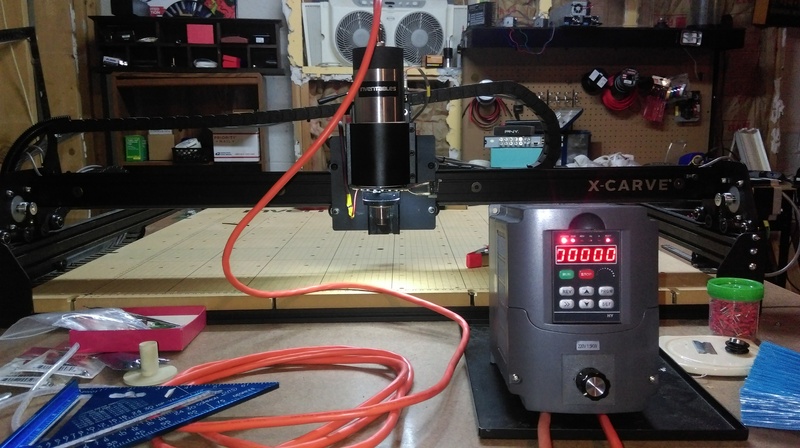 Is your Xcarve a 500 or 1000? Just hooked up a potentiometer to my VFD to control the speed. Much easier than trying to adjust the speed with the buttons. I have the 500 and the .8KW water cooled. I set it at .7KW spindle (to be safer) and then just put in my limits of travel and such. I kept those under 4000 also. If it was not for the chips, the cuts in the aluminum would have been very good indeed. Dave is right about hw good it is. I just have to adjust to cutting with the VFD and at higher speeds now. I got so used to cutting much shallower and slower with the 400W spindle in aluminum that I pretty much and having to "learn my mill" all over again. I have settled on a speed between what Gwizard wants and what i used before. It is more "scratching" than cutting, but it is FAR faster then the OKO with the 400w and will keep my in production until i can get a chip clearing system of some sort in place.